There’s only so much Internet surfing I can take in a day. After I’ve spent all morning and most of the afternoon sitting at my computer, researching writing projects and checking job websites, I finally peel my thighs off the black vinyl chair in my home office, make a feeble attempt to stand upright, stretch a bit, and ponder what to do next. In the several weeks since my four-legged best friend, Shelby, passed on, I find my quasi-empty house rather irritating. Though Shelby wasn’t much of a conversationalist, the fact that she’s no longer here is screaming at me at the top of its lungs. Sometimes my home office feels like the loneliest spot on Earth. Lonely and sometimes unproductive. Today was one of those unproductive days. In my master reinvention plan that is still in the development stage, I forgot to account for days when I won’t be very productive, days like this one when I stare at the computer as if I’m waiting for it to perform some fabulous magic act. Like saving my livelihood. I tap my fingers on the desktop, then nervously bite at my nails, which is not to be confused with actually biting my nails. To bite at my nails means I can’t really be classified as a nail biter. Rather, I’m just tidying up ragged edges and hangnails instead of getting up and going into the bathroom to search for a nail file. If I give in to that whim, I’m likely to lose myself in the huge vanity drawer in dire need of a clean out. And before I know it, it will be an hour later and all I’ve got to show for my time is a half-empty drawer and a suddenly crowded bathroom countertop. Nope, I’m not falling for that again. Instead, I decide to worry about my low productivity tomorrow. This moment calls for a little comfort. Actually, comfort food, to be exact. So I head to the kitchen, which, interestingly, is usually the most organized and productive room in the house. Go figure. I walk into my kitchen with the confident gait of someone who knows who she is and where she is going. I open the refrigerator door with a specific picture in mind: a creamy, tart and sweet, lemon cheesecake I made two days earlier. Sun-Sational Cheesecake is a delicious recipe from a very old, very worn paperback pocket cookbook that belonged to my mother. Published under the name Favorite Brand Name Recipes: Kraft’s Philadelphia Brand Cream Cheese Cheesecakes, the book contains more than 40 cheesecake recipes — some baked, some not — everything from Banana Nut to Carrot ‘n Raisin to Amaretto Peach, or Peanut Butter & Jelly to Cookies & Cream cheesecakes. A little something for everyone. Sweetly topped with a lemon curd (lemon pie filling), the Sun-Sational cheesecake deftly combines the best of two dessert worlds: the lemon pie world and the cheesecake world. Many years ago, when she lent me the book for a particular recipe, my mom told me it was the best book for cheesecakes; that it was one of her favorite cookbooks, and I could keep it if I took care of it and didn’t lose it. Though it’s falling apart, it’s one of my most treasured possessions. This time around, I changed the Sun-Sational recipe a bit (thought I wouldn’t?) by adding some crushed ginger cookies to the graham cracker crust mixture. I thought it might go well with the lemon. It did. In addition, I added more lemon zest than was called for to the cheesecake mixture — as well as to the lemon filling on the top to intensify the lemon flavor. If you feel a slump coming on in your day, make and enjoy this cheesecake — the perfect blend of sweet and tart will send your productivity numbers off the chart! Heat oven to 350 degrees. Mix graham cracker crumbs, ginger cookies, sugar and butter in a food processor; turn out and press onto the bottom and slightly up sides of 9-inch springform pan. Bake 10 minutes. Beat cream cheese, sugar, flour, juice, zest and vanilla at medium speed with electric mixer until well blended. Add 3 eggs, one at a time, mixing well after each. Beat in remaining egg white (reserve egg yolk for topping). Pour over baked crust. Bake 40 – 45 minutes. Remove from oven and loosen cheesecake from rim of pan, but cool before removing the rim of the pan. For the topping: Mix sugar and cornstarch in a saucepan. Gradually stir in the water and juice. Stirring constantly, bring to a boil over medium heat. Boil one minute until mixture is clear and thickened, stirring constantly. Add a small (and I mean tiny!) bit of hot mixture to the reserved and slightly beaten egg yolk. Then add another tiny amount and stir. (This is critical; if you add too much too fast, you will end up with scrambled eggs.) Return egg yolk mixture to saucepan; cook 3 minutes, stirring constantly. Turn off heat and add fresh lemon zest. Cool before spooning and spreading over the prepared cheesecake. Refrigerate to cool completely. Makes 10 to 12 servings. A sweet little tart! 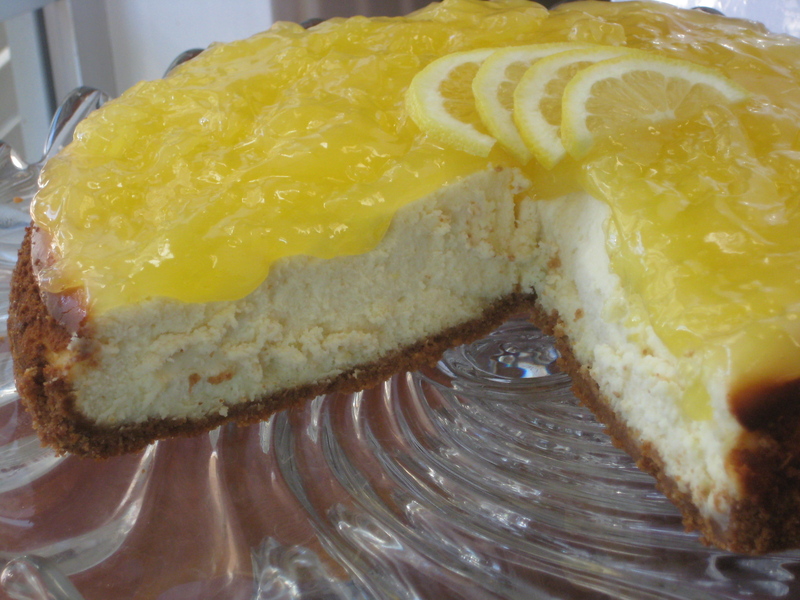 This entry was posted in Comfort Food -- Sweet, Desserts and tagged cheesecake, cream cheese, creamy, dessert, Kraft, Lemons, productivity, zest. Bookmark the permalink. I really like your writing style, great information : D.
Holy moly this looks awesome!! I used to be one of those poeple who hated cheese cake. Cheese should not be sweet!! I thought. Then I slowly started coming around and now I LOVE it. And this looks pretty amazing 🙂 Bookmarked!